Oakdale Junior School take home £1,000 in Groupcall's #TransformYourData contest. 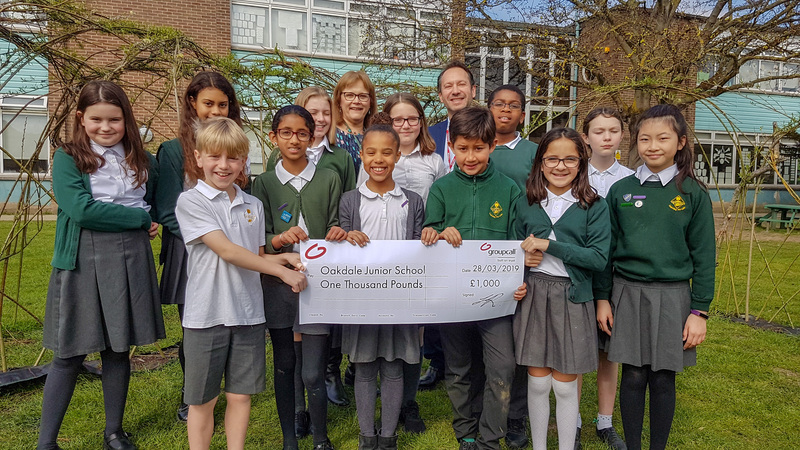 Oakdale Junior School in the London Borough of Redbridge have received a cheque for £1,000 from Groupcall Managing Director Lawrence Royston following our highly successful #TransformYourData photo competition at Bett 2019. Oakdale Junior School run a successful Digital Leaders programme where students in years 4-6 can apply by taking a core skills test. Those who are successful in becoming digital leaders become the 'go to' person in their class for digital challenges faced by both students and teachers alike. As part of the programme, a group of Oakdale's Digital Leaders visited the 2019 Bett Show in January where they spotted the Groupcall transformer, took a photo and posted it on their Twitter account. Amongst around 80 entries, Oakdale's photo was randomly drawn in February alongside the winners of Groupcall's GDPR survey competition. The school plans to spend the money improving their current technology hardware to make the digital world even more accessible to their students.